Do you have employees who contribute positive ideas? Or do you have employees who always seem to whine? It’s great if your employees communicate with you. There are positive and negative ways. If you have employees with whom who dread talking, chances are you have toxicity in your workplace. If your employees whine instead of offering constructive ideas then you’ve got a problem. Aimless complaining is a symptom of problems in teamwork, morale, negativity and/or productivity. In some companies, it’s the proverbial tip of the iceberg. However, you can do something about it. Yes, you can encourage positive employee input without the drudgery of enduring a mere complaint session. Be a good role model by being a positive example. Consider ways to best communicate with the team. Especially be careful when you’re having a bad-hair day like when you’re aggravated, overworked or stressed. Think about your tone of voice and your body language. Don’t use employees as a sounding board. If you need to vent, find a mentor or talk with someone outside of work. When an employee comes to you with a complaint, don’t react by simply dismissing it. Instead, respond. Think about what to say before you say it. Again, watch your tone of voice and body language. Ask yourself if your employee is offering a bona fide suggestion or is merely complaining. Be careful with your biases. Don’t evaluate the employees’ comments based solely on your experiences. If comments come from a person with a different gender, generation, intelligence level, race or background than yours, be empathetic and unbiased. Often, the best input comes from people who are totally unlike you. If your employees won’t come to you first, it might be because they don’t feel safe. You want them to come to you first before they start gossiping or creating morale issues among your staff. The key is to advance or encourage trust in your workplace. If you’re asked to keep something confidential, honor the request if you can. But there are times you can’t. Be a friendly manager not a buddy to your staff. That also means not trying to solve the problem right away, if you need more time to evaluate a situation. 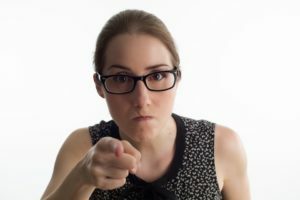 To promote positive criticism not mere whining, schedule a time for coaching each offending worker in a confidential session. Use a pancake sandwich approach – two positives, a negative and then a positive. Give the employee two strokes, diplomatically explain what you want from their communication and end the discussion with another stroke. Make a note documenting the session and put it in the employee’s file. If you’ve done all these things and you still have an employee who doesn’t get it and repeatedly whines, it might be time to try one of two different approaches. One, don’t threaten or bluff the employee, ask if a change in employers would work better. Or, two, know that you might have to lay the groundwork for replacing the person. The bottom-line: At all times, be empathetic as possible but keep in mind the welfare of your company.